Originally published in The Lifted Brow 18. I’m pretty certain I have a multitasking problem – I can’t stop trying to do everything at once. I am certain that it’s to the detriment of my attention span; IMDBing while watching TV means that I’m forever rewinding to relive important plot points otherwise missed. But there are also positives to this tendency, for instance listening to an hour-long podcast while cleaning up is a win for the dishes and me. Yes, I know: multitasking – attention span = symptomatic of a generation, nothing new here. But I can’t even shower without multitasking. I’m not talking about merely brushing teeth or belting out a tuneless track on top of one’s regular personal grooming and hygiene routines, nor am I referring to the many wonderfully intimate and personal ways you can multitask while bathing. Personally, while the Rheem hot water system belts down to clean/comfort/wake me, I multitask by turning my shower into a naked education parlour. How? I have a world map shower curtain and it is ACE. I’d recommend it to anyone who is fortunate enough to live in a house with a shower, but unfortunate enough to need a shower curtain. I have always been poor at geography. Embarrassingly superficial (and in depth) knowledge of an actor’s love life? Sure, hurl a question at me. Important information of fundamental worth regarding the world we live in? Fail. 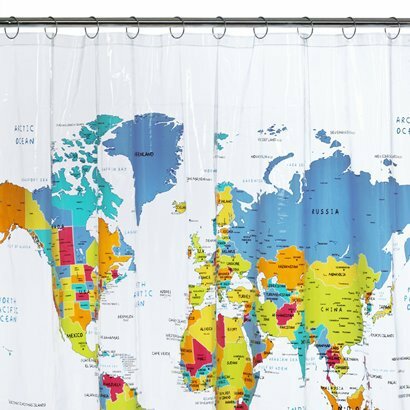 I’ve always wanted to rectify this shameful ignorance but struggle with recall, however my cheap Target world map shower curtain has managed to seep in through the steam and soap. Recently, on top of getting an Ocean’s Eleven trivia question right, I was also awarded points for my correct answer regarding an actual ocean (North Pacific, FYI). And while watching Eurovision, my housemate and I realised we had our cartographic bathroom accessory to thank for teaching us where Azerbaijan is positioned on the globe. It’s also a great catalyst for planning holidays or imaginary adventures before flying out of the shower to work. Obviously, it’s not exactly a topographically accurate display and its gaudy colouring and pathetic font won’t suit everyone’s décor. Regardless, it’s super fun, practical and educational. I’m not quite the geography wizard I long to be just yet, but I now know there’s a place in Canada called Dawson Creek. And that’s good enough for me. Posted in UncategorizedTagged Dawson Creek, eurovision, Ocean's ElevenBookmark the permalink.